On June 5th the second round of presidential elections in Peru will be held. Ollanta Humala’s party Gana Perú and Keiko Fujimori’s party Fuerza 2011 will be measured to define the presidency of that country. The National Office of Electoral Processes (ONPE) expects to have 100% of the results of the elections’ second round no later than one week, as Rocio Salas said, Planning and Budget Manager of the EMB. Peru is a country that is still using a manual voting system to choose their principal authorities, but has already proposed the gradual establishment of electronic voting. On Sunday April 10th, general elections were held in the South American nation. 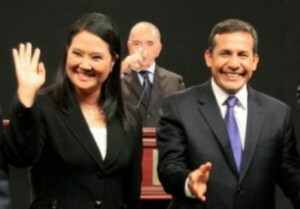 The results forced a runoff as Ollanta Humala won 4’500,196 votes (31.77%) and Keiko Fujimori 3’329,457 votes (23.47%). In Peru, the President and Vice Presidents are elected by direct suffrage. According to the standard approved by the ONPE, to be chosen, the candidates must obtained more than half of the votes, without counting the invalid and blank votes. If none of the candidates for President and VP got more than half of the valid votes, there will be a second election between the two candidates who received the highest vote. This was what happened in Peru, and the reason why a new election was called for June 5. There was an uncertainty in the April 10th elections, and it was reported that Pedro Pablo Kuczynski (from the Alliance for the Great Shift – Alianza por el Gran Cambio) could be in contention with Ollanta Humala. However, this information was released when only 18.6% of the votes had been counted. The results with 95% of the votes transmitted were known on Monday April 11th. With automated voting, unless there’s an obstacle or political interest of the electoral body, the results are known usually the same day of the election. For the second round in Peru, it is uncertain when the results will be disclosed, but the electoral body said that final numbers might take a week. Peru is aiming at the progressive automation of the vote by introducing electronic voting and has already started to regulate the process. We shall wait and see how the political will so that the modernization of the system can be implemented progressively. The Peruvian law allows blank vote. In the presidential election there were 1’422.222 blank votes and 431,468 invalid votes. For the Congress, about 20% of the votes were invalid. It must be thoroughly reviewed the voting system of this country.